Second, we had spent so much time on the exterior of the camper that I wanted to make sure the spare tire cover we ordered was high quality and added to the new look. I didn’t just want to order a plain Jane black cover off of Amazon. I wanted something custom. 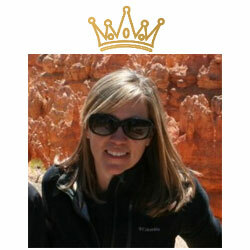 So I scoured the Internet and spent way too long e-mailing companies and checking out reviews. I came across Custom-Tire-Covers.net, and fired off and e-mail. They made it so easy, and it turns out my procrastination was totally unwarranted. The folks at Custom-Tire-Covers.net walked me through how to order the right size, and it is so simple. I should have done this ages ago. 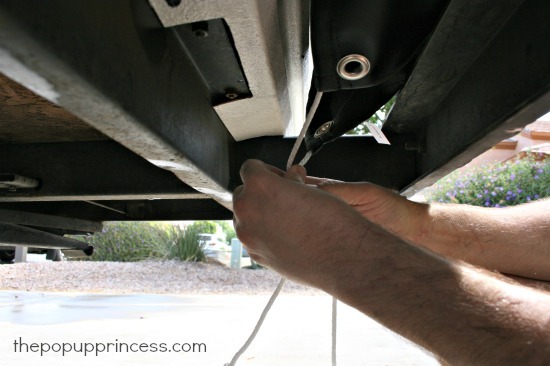 The first thing you’ll want to do is remove your old cover and check your spare. We had just replaced our tires and had the mechanic check condition of the spare and the date code to make sure it was going to be reliable in the off chance we needed to use it. 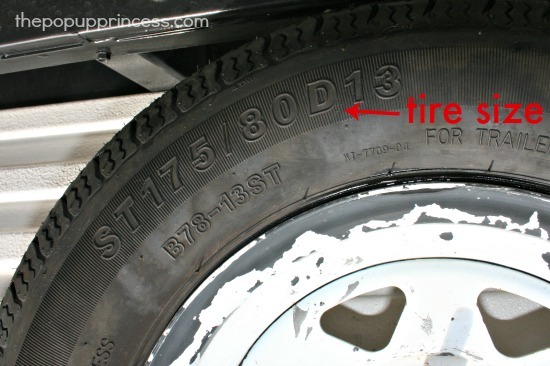 If you need more information on camper tires, you can find some great information here and here. The PopUpPortal is also an invaluable source of information. Jackie and Patrice at Custom-Tire-Covers.net asked us for the size printed on the tire, which can be found on the side wall. It should look something like the picture above. Ours is ST175/80D13. Want to know what all those numbers and letters actually mean? Yeah, I did, too. Here’s a great post on deciphering them. The really important measurement for my tire cover, though is that “D13” at the end. The “13” is my wheel size, so that was the size cover I needed. Custom-Tire-Covers.net takes it a little further, though. They custom make each cover to ensure an accurate fit, so they also asked what type of tire I had. That’s where the “D” comes in. That “D” indicates that I have diagonal or bias ply tires. An “R” would indicate radial. Custom-Tire-Covers increases the size of the material over the tread by 1″ to accommodate bias ply tires, so make sure you know your wheel size and tire type when ordering. Ordering is super simple. They have hundreds of different stock tire covers, so there is something for everyone. They’ve even got a “CUSTOM ITEMS” area where you can design your own tire cover. I had a little bit of fun playing with the design tools, but ultimately, I just e-mailed Jackie and Patrice my logo and had them work their magic. Within a few hours, they sent me a proof for my approval and a PayPal invoice. A couple days after paying the invoice, I had shipping information and a tracking number in my inbox. Less than a week after ordering, my cover was on my doorstep, waiting to be installed. I was amazed at the customer service, too. Jackie and Patrice let me know that they typically try to fill orders within a week, but if they are swamped (like during Christmas), they may take a bit longer. The installation process was pretty simple. The covers come with a 90# cotton rope that you use to secure the cover. We placed the cover on the spare tire, took up the slack with the rope, and tied it off underneath the tire. I had bit of trouble getting a tight fit, but it may just be that I am a bit of a perfectionist. I enlisted Mr. TypeTwoFun’s strong hands to pull the rope tight and tie it off. Once we were happy with the fit, we threaded the enclosed zip tie through the metal grommets at the bottom of the cover. This is to prevent theft of the cover, not to secure the cover itself. The installation instructions caution against tightening the zip tie too much. You just want to make sure it is snug, but not pulling on the grommets. Thanks, Jackie and Patrice! You guys rock! 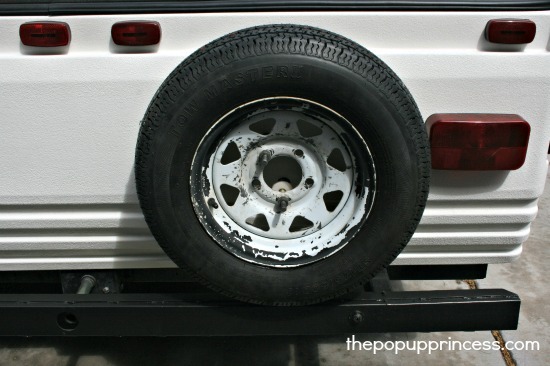 Has your spare tire cover seen better days as well? Want to win a new cover of your own? 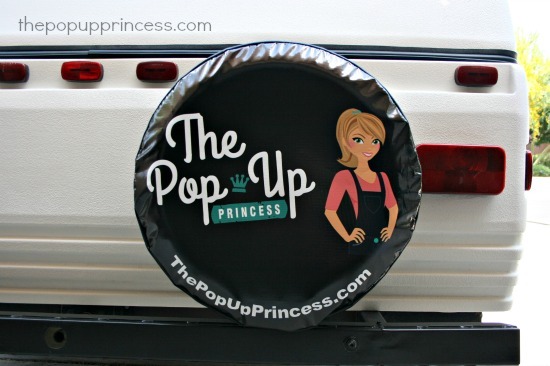 Custom-Tire-Covers.net has been generous enough to send us one stock tire cover (valued at $59.99) to give away to a lucky Pop Up Princess reader. All you have to do is like Custom-Tire-Covers on Facebook and visit Custom-Tire-Covers.net, peruse the enormous selection of tire covers available through their website, and come back here to leave a comment on which cover you’d pick if you are selected as the winner. 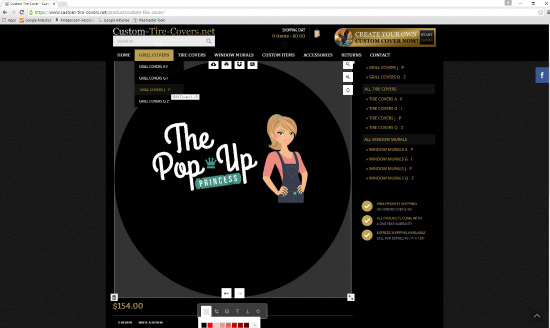 Bonus entries are available for following Custom-Tire-Covers on Instagram and The Pop Up Princess on Instagram and Twitter. See the entry form below for more details… and good luck! Thank you for this giveaway. My family had fun looking at all the beautiful tire covers. I ‘m so glad I found your website. We just bought a 2002 Sante Fe in really rough shape. We LOVE your ideas and step by step tutorials. Our PUP didn’t come with a spare tire cover, so winning one would be terrific! It was so hard to narrow it down to just one. They are all great! My pup would look great with a new trout spare cover! What a talented idea! So many to choose from! If I win I’m going to have to paint the pup because the tire cover will make the rest of the trailer look shabby! Wonderful idea for a giveaway. A definite improvement for anyone’s camper. The cover is usually the last thing you think about.. Thank you for the tire cover referral and your website. 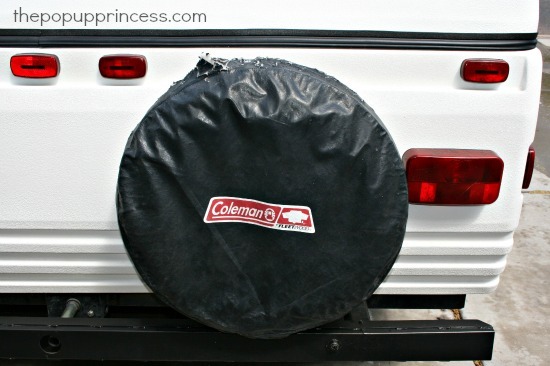 We just ordered our custom tire cover for our 1988 Coleman Laramie that we are re-doing (exterior first). Happy Camping! We just purchased our first pup (used) and have lots of grandiose plans to upgrade, remodel, and glamper. Looks like this website will be the first we go to in order to get some ideas on what can be done and how. BTW, love your spare cover. We are very involved in a hobby that can support a personalized cover. Going to go check out Custom Tire Covers next. Larissa- I’d LOVE a post about the outside paint job…going to take our decals off this week and if it’s not too bad, I’ll be painting, too!